Saturday, October 25 marked the first day of the new year according to the Islamic calendar. Of course in all traditions, the new year is the perfect time to reflect on the past; and looking back, year 1435 (that is, November 2013-October 2014) was a busy one for Morocco. Check out our top ten headlines below! The Moroccan Ministry of Endowments and Islamic Affairs announced on February 12, 2014 that King Mohammed VI agreed to requests from Tunisia, Guinea, and Libya for cooperation on religious matters, including providing training in Morocco for imams from the three African nations. 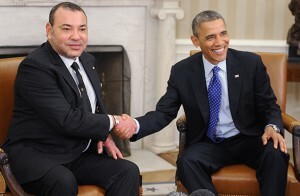 Morocco and Mali had begun a similar effort in September 2013, when King Mohammed VI and Malian President Ibrahim Boubacar Keita presided over the signing of an agreement to send 500 Malian imams to Morocco over the next two years for training in using Morocco’s moderate and tolerant form of Islam to help fight the spread of extremism. US and Moroccan business and government leaders convened at the Ministry of Foreign Affairs and Cooperation in Rabat, Morocco on March 10 and 11 for the 2nd Annual Morocco-US Business Development Conference. The two-day event offered American companies an in-depth look at trade and investment opportunities in Morocco. On March 14, 2014, Morocco’s Council of Ministers, chaired by King Mohammed VI, announced its decision to pursue expansive reform of Morocco’s military justice system, which would include ending the use of military tribunals to try civilians. The new law is “a major step towards strengthening the rule of law, reforming the judiciary, and protecting human rights,” said Driss el Yazami, President of Morocco’s respected National Human Rights Council (CNDH). At a House hearing held April 9, 2014 on US policy toward Morocco, key members of the Foreign Affairs Committee reiterated the United States’ commitment to supporting Morocco through its ongoing democratization and praised the North African country as a model for moderation and a strategic ally. Marking 15 years of his reign, Morocco’s King Mohammed VI delivered a speech to the nation on July 31, 2014, taking stock of the progress made to improve the lives of Moroccans, continue ongoing advances, and strengthen the country’s partnerships with the US, Europe, Africa, and the Middle East. More than a dozen high-ranking Moroccan officials and business leaders made a strong case for Morocco’s key role in promoting economic development and stability in Africa at the US-Africa Leaders Summit in Washington, DC, held August 4-6, 2014. The Moroccan delegation attended more than 70 events that resulted in a number of public statements and signed agreements in the areas of business, education, counterterrorism, and more. At its 5th ministerial meeting held in New York September 23, the Global Counterterrorism Forum (GCTF) previewed a number of new counterterrorism initiatives in which Morocco will play a central role. “I want to thank our colleagues from Morocco and the Netherlands for spearheading the forum’s effort to develop the first global set of good practices on stopping the flow of foreign terrorist fighters, which we will adopt here today,” said US Secretary of State John Kerry in opening remarks at the Forum. And for more headlines, check out our Press Page!